The Cease and Desist letter is used to inform someone of a copyright violation. Many individuals still copy images and text without realizing it is a violation of someone else's rights. Many others do so with that knowledge figuring they won't be caught or punished. If the individual will not cease you can confront their ISP. Also consider copyrighting your code, text and photos with the US Copyright Office before publishing. The verbose version is a more strongly worded version for use when its more likely to be a willful infringement. Contract Software is nothing short of a stellar tool for any business professional." This Copyright Cease and Desist Notification Form (Verbose) is included in editable Word format that can be customized in Word or by using the included Wizard software. Re: Unauthorized Use of Copyrighted Work. It has come to our attention that you have made an unauthorized use of our copyrighted work, a Insert type of media, i.e., photograph, video, publication, etc. entitled the name of the infringed work (the "Work"). The infringed Work is on file with the U.S. Copyright Office copyright filing number. Insert direct link to the original infringed work. This statement is written on the assumption that most copyright infringement will be from source material copied from the Internet. If the infringement was from physical works, change the description accordingly. Also, submit the cease and desist demand with printed copies of both the original source material and infringing material. This web page makes clear in several locations that the Work is copyrighted and that any unauthorized use is prohibited. Company Name has made unauthorized use of the Work in a Insert description of how the work was infringed, i.e., web site, advertisement, mass email campaign, etc. (see attachment). No license has been purchased by Company Name from Company Name and no authorization was given by Company Name to use this copyrighted and registered work. Insert any extra information that helps back up your infringement claim, such as any research you have done regarding specifically when the infringement occurred, third-party information that helps your case, and information about who effected the infringement. As you can easily determine by comparing the Work and the infringing version, they are the same. If you can show willful violations such as copyright notices, watermarks, etc. being removed, describe these alterations to the infringed work. Company Name distributed this infringing work via a Insert description of how the infringing work was distributed on date that the infringement occurred or was detected. It is a violation of U.S. copyright law to reproduce and/or prepare a derivative of a copyrighted work (17 U.S. 106). It is also a violation of our license agreement to make unauthorized use of copyrighted content without payment or permission. In addition, under 17 U.S. 1202, it is unlawful to remove or alter copyright management information, including identifying information about the copyright owner contained in a digital watermark. If there are other issues that were violated by the unauthorized copying, also state them here. For example, the normal use of an image may require separate written authorization from a third party, such as the use of an image requiring not only a license but written permission from a recognizable person in a photograph. Add as many details as possible to your claim, showing as many problems created by the infringement as possible. The removal of a digital watermark, after the Work was copied from a web page clearly identifying it as copyrighted and for licensed use only, indicates that the infringement has been performed willfully. Under 17 U.S. 504 and 505, infringer could be liable for statutory damages as high as $150,000 per violation together with attorneys' fees and costs necessary to secure a judgment in court. Reword that statement as needed. The statement above is based on the assumption that the Work was copied from an Internet web page owned or controlled by you and that you had copyright notices displayed. If you believe you have the right to use the Work without our authorization, please advise us in writing, and provide documentation to support your position. Otherwise, we demand that you immediately cease the use and distribution of all infringing works reproduced using and/or derived from the Work, purge all copies of the Work, and desist from this or any other infringement of our rights in the future. We also demand that you conduct an investigation and inform us in writing of each unauthorized use of the Work and any other works obtained from Company Name. We further demand payment of Insert dollar amount of your demand for immediate resolution of this matter. If we are forced to incur legal expenses in this matter, we will demand those in any future resolution. Please respond to this letter by Effective Date, indicating in writing that you have fully complied with these requirements and agree to these terms. This letter and demand are offered in furtherance of settlement and are subject to ER 408 and not admissible to prove liability for, or invalidity of, any claim. We retain all rights in the copyright and other interests in the Work and all claims we may have against any person or entity. This letter is not a full recitation of all relevant matters, and nothing omitted and/or contained herein shall be construed as or deemed to be an admission or waiver. We appreciate your cooperation with this matter, and look forward to your prompt response. 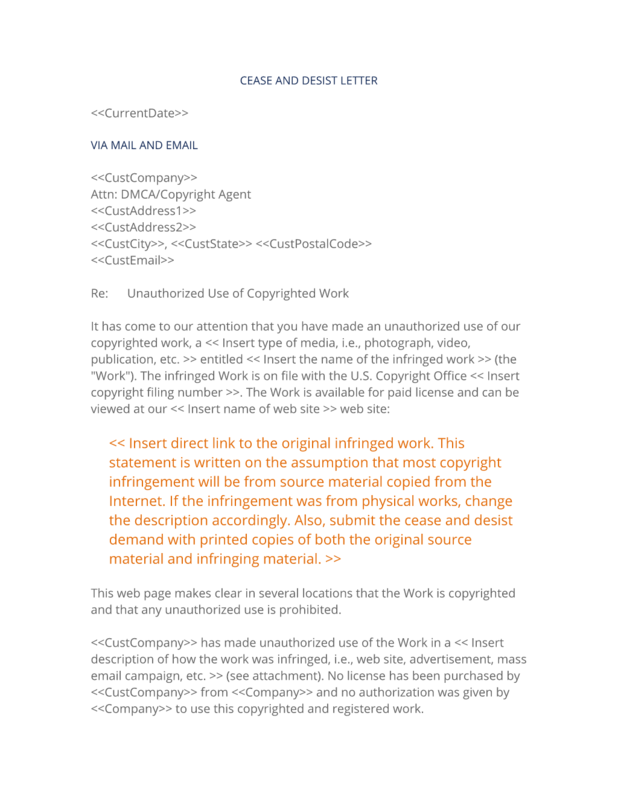 The complete Copyright Cease and Desist Notification Form (Verbose) - with the actual formatting and layout - is available in this Contract Pack.